Blackheads, medically known as open comedos, are similar to acne, but without the layer of skin covering the top. Pores get plugged with dirt, dead skin and sebum -- a fatty lubricant that oxidizes and turns black when it comes into contact with air. Don't think a quick squeeze is the answer; pinching can drive more dirt into the pores and cause inflammation and scarring. The secret to banishing blackheads and keeping them from coming back is a skin care routine that includes acne-fighting ingredients and exfoliation. Wash your face twice daily with a cleanser containing salicylic acid or benzoyl peroxide. Benzoyl peroxide may be faster and more effective, but it can also be too harsh for dry or sensitive skin. Salicylic acid is gentler, but effective for all skin types. Both ingredients help loosen and dissolve the waxy plugs blocking your pores. Cleansing with these ingredients also helps keep new blackheads from forming. Use a mechanical skin cleansing brush. The benefits of using a brush to wash your face are twofold: It helps fight blackheads by exfoliating skin, and allows active ingredients such as salicylic acid to penetrate skin and do their job more effectively. Clean the brush heads after each use to avoid spreading bacteria. Replace them as recommended. Blast pore-clogging oil, dirt and dead skin with regular exfoliation, a key in any blackhead fighting regimen. Try alternating between manual exfoliants, such as a gentle grainy facial scrub, and the chemical variety, such as a glycolic acid home peel, to see which works best for you and your skin. Exfoliate once or twice a week. Apply a once daily medicated acne treatment cream to problem areas with, you guessed it, salicylic acid. Over-the-counter products range in concentrations from 0.5 to 2 percent salicylic acid. Use products with a lower concentration, or cut back on how often you apply, if you notice dryness, irritation or redness. Give your treatment time – it can take anywhere from a few days to a week to yield results. 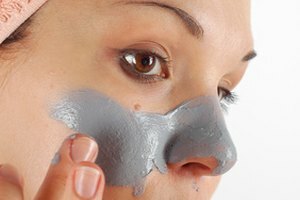 Use a weekly mask with ingredients such as clay, charcoal, Kaolin or salicylic acid. Such masks can help draw out impurities and keep oil under control, combating existing blackheads and preventing the formation of future ones. Try an over-the-counter retinol skin product or a prescription retinoid. Mostly touted for their wrinkle-fighting ability, retinoids can also be effective on blackheads by gently speeding up skin cell turnover. How Does a Mud Mask Exfoliate the Skin?